With the 1903 introduction of the ‘Naval’ or ‘staff’ pattern forage cap throughout the Canadian Militia many individual Militia regiments found themselves in need of an appropriate badge to decorate this new style of cap. Some regiments had previously worn a badge on the Glengarry and simply adopted these as an interim measure. Other regiments, however, had either worn numerals or nothing on their Glengarries. Shortly after the February 1904, General Order (GO 18) approved the ‘Naval’ pattern forage cap for the use the 67th “Carleton Light Infantry”, their Commanding Officer felt that the new forage cap was an opportunity to acquire a new, distinctive, badge. In early May 1904, Lieutenant-Colonel J. Baker, the Commanding Officer, submitted a design to the District Officer Commanding, Militia District 8. The submission was forwarded to Ottawa and, ultimately, General Order 77 was published in June 1904. 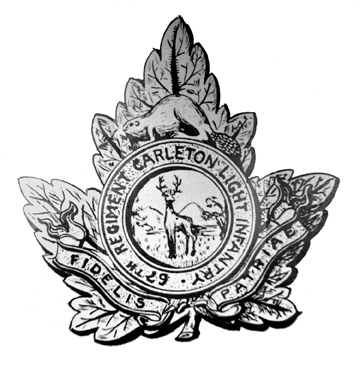 This GO described the badge as ‘On a bronze maple leaf, a silver ring, inscribed “67th Regiment Carleton Light Infantry”, surmounted by a beaver, and in gilt, within the ring, a deer in the open with hills in the background. Underneath, on a scroll, the motto “FIDELIS PATRIAE.” The badge is described again in the 1907 Dress Regulations. The incredibly quick approval, from submission in May to approval in June, would not re-occur. for approval in May 1904. The Quartermaster-General submits for the consideration of the Honourable, the Minister in Militia Council, the question of the provision of badges for the Carleton Light Infantry, being necessary in consequence of the re-organization of the unit. In 1925 it was discovered that the CLI badges had been manufactured and supplied to the regiment yet no approval for these had ever been published in General Orders. This oversight was remedied with an amendment to the 1907 Dress Regulations (GO 2, 1926) deleting the old badge description and replacing it with that of the ‘new’ badge. Original 1920 design showing the battalion number crossed out. Final artwok for the 1920 design. The CLI made a good reputation amongst Militia regiments in the Maritimes and, in 1930, came second in the Canadian Infantry competition of Militia regiments. That same year the CO proposed a change to the badge in order to incorporate the “Kentish horse” and a change of the motto to “INVICTA”. These elements were taken from the CLI’s allied British regiment, the Queen’s Own Royal West Kent Regiment. In order to proceed with the change the CO had to agree that public funds could not be used and any costs associated to the replacement badge would be borne by the regiment. 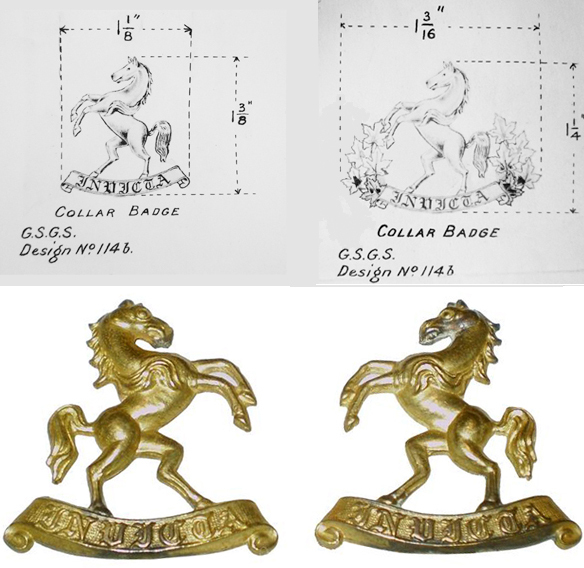 The Regiment also proposed collar badges with the Kent horse rearing on a scroll marked “INVICTA”. HQ turned to Colonel Fortescu Duguid, Director of Historical Section (DHS) for his comments on the proposed badges. Fortescu was an avid heraldist and historian and was deeply involved in early designs for a proposed Canadian flag in the 1930s. Duguid recommended that the cap badge be amended so that the maple leaves used in the wreath were of the same pattern as those approved for Regimental Colours. He also suggested that, while the white horse of Kent was a ‘traditional’ symbol and not an ‘honour’ bestowed on the West Kent Regiment, the use of “INVICTA” would require Royal assent before the Carleton Light Infantry could adopt it in lieu of their approved motto “FIDELIS PATRIAE”. Design modified by HQ. The numerals, and title have been changed. Accordingly, in January 1931, GSGS prepared drawings for CLI approval but the Regiment insisted on the original design. With the design now finalized, HQ sought formal approval from the War office – for the use of the Royal West Kent badge as adapted to the CLI, from the King – for the use of the White Horse of Kent and, finally, from the Minister of Militia – for final Canadian approval prior to publication in General Orders. Fig 4 – Original collar badge design. Proposed designs with the addition of maple leaves. Production badge (courtesy British Badge Forum). By 20 May 1931, all approvals had been filed and the new badge was described in GO 74. In keeping with the original request, the Regiment was now responsible for the production of the badges, including the manufacture of dies and tools. Once the badges were made and distributed the dies, and sample badges, were to be sent to HQ. At this point the tale should end, however, by September 1931, HQ asked the CLI why they had not yet changed over to the new, “approved” badge? HQ agreed to a six-month delay in obtaining badges but took advantage of the opportunity to remind the CLI that Royal assent was obtained and that the CLI were currently wearing unauthorized badges, a situation they described as ‘irregular’. Nonetheless, by February 1934, the dies had still not been made and the CLI, under its new Commanding Officer, Lt-Col W.B. Manzer, asked HQ to consider the use of public funds, arguing that “It was found that the situation, as regards the possibility of funds being available for the purchase, had considerably changed, and that due to the present financial conditions by which everyone is seriously handicapped, there was little likelihood of funds being available for the purchase of these dies and tools, etc. and provision of Badges.” HQ declined to pay for these as it would set an unacceptable precedent. Finally, on 24 November 1934, over three years after the publication of the General Order, the CLI wrote HQ: “The Unit is still unable to find sufficient funds to cover the cost of purchasing the necessary Dies and Tools together with a first issue of 500 sets of Badges. The cost of the foregoing is estimated to be as follows: Dies and Tools $292.00, 500 sets Badges $125.00. The total amount available at the present time and at the disposal of the Commanding Officer for this purpose is only $240.00. The Commanding Officer states that in view of the present restricted training establishment, a first issue of only 200 sets of Badges should be quite sufficient for immediate requirements.” The CLI indicated that they were prepared to raise the necessary funds if permission to limit the initial quantity to 200 sets was approved. The approval for the reduced quantity was communicated to the CLI and Scully provided lead impressions of the badges in February 1935. In May 1935, the badges were finally distributed to the CLI, with a sample set deposited at HQ. However, the badges had a short life as, on 15 December 1936, it was amalgamated with The York Regiment and renamed The Carleton and York Regiment. On 31 October 1954, The Carleton and York Regiment was amalgamated with The New Brunswick Scottish and redesignated the 1st Battalion, The New Brunswick Regiment (Carleton and York). On 18 May 1956, the regiment was redesignated as The Royal New Brunswick Regiment.